Laura and I just returned from our trip up to Cheesehead country. Don’t worry they call us names too! If you didn’t know we were in Madison, WI for the Quilting Expo with Nancy Zieman. We had a great time and saw lots of friends. Susan from Rochester MN came into the booth and showed me the picture of her finished project from taking my class. 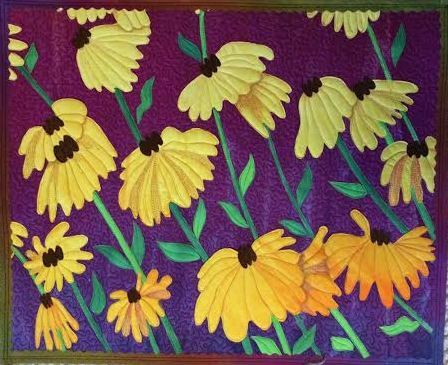 She told me she did a little thread painting on some of the petals of the flowers to darken them and give more texture to the piece. I taught up there two October’s ago and had a wonderful time. I love driving through farm fields and country roads in the autumn. It was a warm week and I remember the look and smell of the farm fields as I was driving there. I am lucky to have a job where I get to make new friends all the time. I don’t think there is anything like it. This is one of my favorite patterns and I love the color combinations in it. This event is held at the Greater Philadelphia Expo Center in Oaks, PA. There are still a few spots in my class, why don’t you join us?